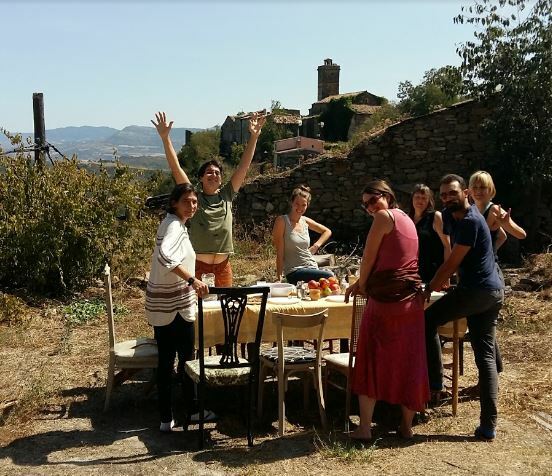 This summer Eroles Project hosted two international residencies in Spain focusing on Deepening Citizenship and Emerging Politics. 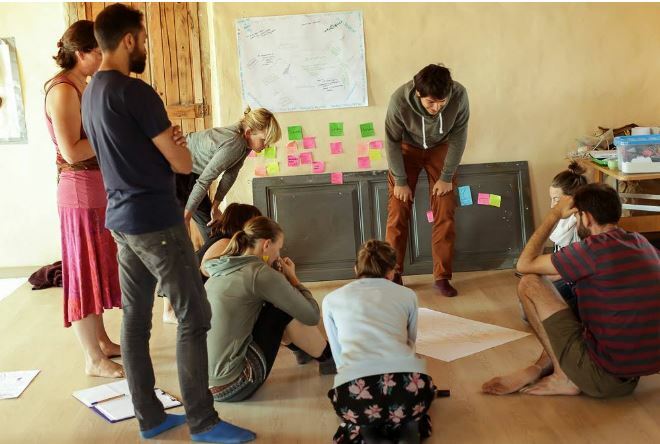 During the second residency 10 people gathered for 12 days in the rural village of Eroles to share their understanding, experience and practice of Emerging Politics. In this blog post they attempt to (re)define politicking, a word that they feel could be the beginnings of shaping a new philosophy towards doing politics consciously. This is the second blog from our Guest Editor – The Eroles Project – read their first, ‘Deepening Citizenship’. Les mots nous relient au monde mais, dans le même temps, définitions rigides nous enferment. Words connect us to the world but, at the same time, rigid definitions confine us. Alors, plutôt que de créer une définition unique, il s’agissait plutôt de révéler au sein du groupe les différences d’appréciation, de les écouter, de les savourer, de les observer résonner en nous. So, rather than creating a single definition, we wanted to reveal the different perspectives within the group, to listen to them, to savour them, and to observe them resonating within ourselves. “Politique” – Dès que le son du mot s’est déployé dans le silence attentif du groupe, nous en avons immédiatement ressenti la subtilité et la saveur. “Politicking” – As soon as the sound of the word unfolded in the attentive silence of the group, we immediately felt its subtlety and flavor. Politicking semblait transporter avec lui toute la poésie que “politics” ne pourrait jamais incarner. Politicking seemed to carry with it all the poetry that “politics” could never embody. Un mot libre du poids de l’histoire et (pour nous à ce stade) n’ayant aucun sens pré-établi. A word free from the weight of history and (for us at this stage) with no pre-established meaning. Mais une excitation de l’idée de “faire” la politique de façon active et consciente. But bringing an excitement of the idea of “doing” politics actively and consciously. Can re(defining) a word catalyse a new way to consider and engage with politics? During the residency we began a co-authored document, 10 of us thinking together, typing in our own language, attempting to (re)define the word politicking as a verb, in a way that was true for us – both during the residency and out in our civic and political lives. We didn’t want to create a fixed manifesto, but rather a call to action/reflection, a call to co-create a living, contemporary definition, with the power to catalyse a new way to consider and engage with politics and being political. Our aim is to add a definition to Wikipedia; to spark people around the world to engage in the conversation and contribute to the evolution and enlivening of the verb politicking. This blog is our first step to spreading this idea, and therefore we’d love to hear what you think. Please add comments, thoughts and suggested amendments at the bottom and get in touch! So, what exactly do we think are the qualities of politicking? Politicking changes the passive and often disempowering noun of Politics into a verb, for the people and from the people. It involves a shift in ideology – and – the willingness for both reflexivity and enacting. It leaves the ‘us vs. them’ dichotomies and debates of far away partisan party politics and enters our daily lives. And it can show us that we live those lives through ‘sensemaking’, ‘decision making’ and ‘co-creating’ with those around us. 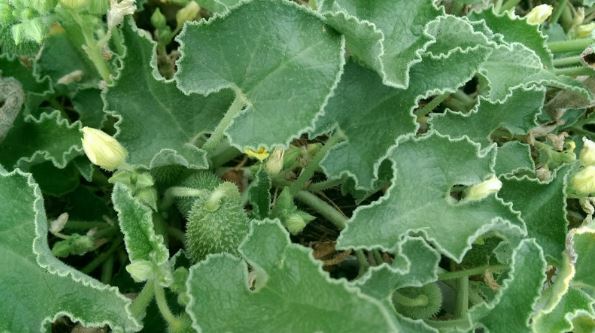 And it is those interactions exactly, which are at the heart of everything political, regardless of whether they might happen in a national parliament or in our garden. At the moment we often think of politics happening inside big buildings. But we found that, for us, politicking actually happens best in public spaces, as we discovered when we took an embodiment exercise to the streets in our local town. To inhabit and shape the public realm reminds us that it actually belongs to all of us and it can’t be built upon, closed down or privatised so easily. It is the realm where our interactions become open for everyone to join. Politicking is neither about the collective nor the individual, but the I in the we and the we in the I. This inter-relationship and the extraordinary creativity, caring and capacity to self-organise that can emerge from it. E se fosse in italiano, sarebbe politiCARE, una polis che CARE, si prende cura. And if it were in Italian, it would be poliCARING, a polis* that CARES, takes care. *an ancient Greek word that refers to a ‘city’ and the body of citizens within it. Politicking is most alive when ‘being me and also us’ – as coined by Alison Stallibrass in her review of the Peckham Experiment (1926-1950), a pioneering exploration of wellness in community. One realisation we had during the residency, when tracking back over the projects/movements we’d been involved with, was how much more of a sense of belonging and deep change we had felt when our projects had been at least somewhat place based; rooted in relationship with place and people. We think politicking happens best locally whilst also sensing, exchanging and ‘net-weaving’ (as opposed to ‘networking’) transnationally. To politick or not to politick? Politicking is available for free, for and with everyone, at all times. It has been forever and will keep evolving as our societies evolve. We feel it’s time to make ‘politicking’ a more spoken about thing, so as to bring awareness and consciousness to the way in which we are doing it. You’re doing it right now in fact, as you read, reflect, comment on this blog. During the residency we found that when we questioned our comfortable ways of being together and reflected on what we were avoiding – rich and potent stuff came up. For example when we challenged the assumptions of power in the room, we were able to move to a more risky and truly co-creative space. So we came to the point that if all the above is part of it, politicking can open space for fascinating dialogue and action. A space for multiplicity, diversity and wisdom. It values listening with curiosity, with the intent to understand and not just to respond. A fantastic example is the Indignados movement in Spain that began in May 2011 (known as 15M). During this time millions of people gathered in assemblies on the streets and squares of Spain’s cities. Thousands of people learnt to ‘make politics’ through taking part in collective decision making processes about things that mattered to them. This in turn helped to create a ‘politicking’ culture which began to erode outdated structures of gender, race, wealth and status. 15M has been the catalyst for multiple collaborative political parties, like Marea Atlantica; a member of which, Diego Jiménez, also joined the residency. Bringing our whole self into active being with others, understanding the need to ‘become with’ one another, our surroundings, our circumstance, the ecosystem, the terrain of everyday life. ...along with the other animals, the stones, the trees, and the clouds, we ourselves are characters within a huge story that is visibly unfolding all around us, participants within the vast imagination, or Dreaming, of the world. On a vision quest where we spent a night on the mountain by ourselves, listening, watching, and becoming with. Taking this idea outside of Eroles it evokes a relationality that invites us to consider ourselves and our politicking as more than our immediate identities, nations, lineages and even beyond ourselves as a species. No decision should be made without consulting and taking into account the responses of those most affected, usually the poorest of people and the earth. Both we as people and the world as a whole is, and will always be, changing. As such the way in which people politick is and will be in flow; learning and adapting as the conditions and contexts change over our lifetime and in the generations to come. Even though the goals may be transient, and the process emergent, we need to trust and fully commit to our ideas and projects. As it is in the doing and being that our life’s activities evoke change. And this chaos becomes a wonderful thing, because it opens the door for change in the first place. At least this is what we felt at the end of our residency, carrying our culture of politicking now out into the world and to the places where we are rooted, while having found new roots in our Eroles companions as well. The activity of trying to persuade or even force others to vote for a particular political party or candidate. The recounting of long tales, stories, or jokes while holding a lit bowl of marijuana, to the exasperation of those assembled. pol·i·tick (pŏl′ĭ-tĭk) intr.v. pol·i·ticked, pol·i·tick·ing, pol·i·ticks, pol′i·tick′er n.
(often derogatory) The act of engaging in politics, or in political campaigning. Please add your thoughts and responses in the comment section, we love the idea of more people exploring, discussing and defining what it is to politick! To read more about the ideas behind these residencies and the work of the Eroles Project, check out their website.